The purpose of this post is two fold, primarily it’s to help new comers on their first run through who may be having difficulty. Additionally it’s for the sharing of strategies amongst the more experienced players. WarMage allows for a variety of tactics that would not work in Nightmare mode so hopefully we’ll see people posting some unique strategies. I look forward to seeing all your submissions! For my play through I’ve not upgraded any traps and I’m not using the DLC traps & weapons just so it will be useful to more people (tho I do cover the DLC maps). Fryedegg is doing a high scoring series using all traps with excellent commentary giving lots of great tips. Strategy: Gauntlet of Floor Spikes with Tar at the end to slow any who survive. Fryedegg: Lightning Ring, Blade Staff, Flame Bracers, Tar, Floor Spikes, Brimstone, Wall Pusher, Grinder, Barricade. Strategy: Build a killbox in the choke point nearest the enemy spawn point using Barricade, Grinder, Tar, Wall Pusher, Floor Spikes and Brimstone. Use Lightning Ring, Flame Bracers and Blade Staff plus the map provided Archers to increase combo scores. Steel Weaver: Take the first upgrade at the end of wave 1, take the Burning Pitch upgrade as soon as you can during wave 3. Smeggit: Floor Spikes, Tar, Arrow Wall. Strategy: Arrow Walls and Tar at the first choke point with Floor Spikes in front. Fryedegg: Lightning Ring, Blade Staff, Flame Bracers, Tar, Brimstone, Grinder, Barricade, Arrow Wall, Archers. Strategy: Build a killbox at the end of the corridor near the rift using Barricade, Grinder, Tar, Arrow Wall, Brimstone and Archers. Use Lightning Ring, Flame Bracers and Blade Staff to increase combo scores. Steel Weaver: Take the first upgrade at the end of wave 1, take the Burning Pitch upgrade at the end of wave 3. Strategy: Simply line the first corridor with Floor Spikes, Arrow Walls and Tar traps. Fryedegg: Lightning Ring, Blade Staff, Flame Bracers, Tar, Brimstone, Grinder, Barricade, Swinging Mace, Archers. Strategy: For round 1 build a killbox under the bridge using Swinging Mace and Tar. At the end of round 1 sell all traps and build a killbox in the same place using Barricades, Tar, Grinder, Swinging Mace, Brimstone and Archers. Use Lightning Ring, Flame Bracers and Blade Staff to increase combos. Steel Weaver: Go straight for Burning Pitch at the end of wave 3. Smeggit: Wind Belt, Floor Spikes, Tar, Arrow Wall. Strategy: Arrow Walls and Tar at the first choke point, Floor Spikes and Arrow Walls in the first area with Wind Belt to blow Orcs into the pits. Fryedegg: Lightning Ring, Tar, Brimstone, Grinder, Barricade, Swinging Mace, Archers, Arrow Wall, Floor Scorcher. Strategy: For round 1 build a killbox in the first choke point using Swinging Mace and Tar. At the end of round 1 sell all traps and build a killbox in the same place using Barricades, Tar, Grinder, Swinging Mace, Brimstone, Floor Scorchers, Arrow Wall and Archers. Use Lightning Ring and Cross-Bow to increase combos. Steel Weaver: Take the first upgrade before wave 1, get Burning Pitch by the end of wave 4 or 5. Smeggit: Wind Belt, Floor Spikes, Tar, Arrow Wall, Archer. Strategy: Killbox setup on the corner after the second door, Floor Spikes and Arrow walls followed by Tar to slow any survivors. Fryedegg: Lightning Ring, Flame Bracers, Tar, Brimstone, Grinder, Barricade, Archers, Arrow Wall, Floor Scorcher. Strategy: Build a killbox near the rift using Barricades, Tar, Grinder, Brimstone, Floor Scorchers, Arrow Wall and Archers. Use Lightning Ring, Flame Bracers and Cross-Bow to increase combos. Steel Weaver: Take the first upgrade at the end of wave 1, get Burning Pitch at the end of wave 3. Smeggit: Wind Belt, Floor Spikes, Tar, Arrow Wall, Archer, Barricade. Tip: Place Barricades on the stairs so that if the wind belt blows any Orcs right over the pit their path is still blocked. Strategy: Block off upper path with barricades on the stairs. Set up a killbox at the entry to the lower path using Floor Spikes, Arrow Walls, Tar and Archers. Use the Wind Belt to blow Orcs into acid pits. Strategy: For round 1 build a killbox directly in front of the enemy spawn point using Tar, Brimstone, Arrow Wall, Floor Scorcher and Archers. At the end of wave 1 sell all traps then place Barricades in the entry to the South passage. Start building a killbox in the entry to the West passage using Barricades, Tar, Brimstone, Grinder, Swinging Mace, Floor Scorcher and Archers. Use Lightning Ring and Cross-Bow to increase combos. Steel Weaver: Take the first upgrade after wave 3, get Burning Pitch during wave 5. Note: There is a small bug in regards to Barricade placement, see 0:15 in the video. Strategy: Block left hall with Barricades placed after the stairs. Set up a killbox in the right hall after the stairs using Floor Spikes, Arrow Walls, Tar and Archers. Enemy Tactics: Ogres: Headshot them till they get inside the killbox then stun them with Cross-Bow alt fire. Fryedegg: Lightning Ring, Tar, Brimstone, Zapper, Floor Scorcher, Grinder, Swinging mace, Barricade, Archers. Strategy: Before the 1st wave starts gather up all the map provided Boom Barrels for later use. Begin by building a killbox in the East corridor at the low roof point near the rift, use Barricades, Swinging Mace, Tar and Grinder. At the end of wave 2 block the West corridor with 2 Barricades placed right at the end of the corridor near the rift. From this stage continue to build up the killbox using Barricades, Swinging Mace, Tar, Grinders, Brimstone, Floor Scorchers, Zappers and Archers. Use Lightning Ring, Cross-Bow and Boom Barrels to increase combos. Steel Weaver: Take the first upgrade before wave 1. Upgrade to Burning Pitch at the end of wave 3. Take Overcoiled Springs at the end of wave 6. Enemy Tactics: Ogres: Stun with Cross-Bow alt fire if necessary, kill with Boom Barrels and use Cross-Bow to increase combos. Smeggit: Wind Belt, Floor Spikes, Tar, Blade Wall, Archer, Barricade. Strategy: Slightly different tactics for this one. For the first 2 waves set up a killbox at the end of the bridge using Blade walls, Tar and Floor Spikes. At the end of wave 2 quickly sell all the traps then use Barricades to block the left entry to the central room and block the right entry to the room with the rift. Wave 3 comes from the lower area, take them out with the Cross-Bow when they come up the stairs. Build up a killbox along the wall in the central room using Blade Walls, Tar, Barricades and Archers. Enemy Tactics: Ogres: When they are in the killbox stun them with Cross-Bow alt fire and headshot them. Fryedegg: Lightning Ring, Tar, Brimstone, Arrow Wall, Floor Scorcher, Grinder, Barricade, Archers. Strategy: For the first 2 waves build a killbox at the end of the bridge using Grinder, Tar, Brimstone and Arrow Wall. After wave 2 sell all traps and then block the West passage with Barricades. Start building a killbox in the entry to the East passage using Barricades, Tar, Brimstone, Grinder, Arrow Wall, Floor Scorcher and Archers. Use Lightning Ring and Cross-Bow to increase combos. Steel Weaver: Take the first upgrade at the end of wave 2. Upgrade to Burning Pitch During wave 4 or 5. Enemy Tactics: Ogres: Head shot and Lightning Ring. Smeggit: Wind Belt, Floor Spikes, Tar, Arrow Wall, Archer, Barricade, Spring Trap. Strategy: For the first 3 waves place Spring Traps in front of the far spawn point and use Archers with Wind Belt as backup. After wave 3 when you have a long break sell all traps and Archers. Place Spring Traps in front of the second spawn point and cover the area with Floor Spikes & Arrow Walls followed by Archers. Enemy Tactics: Ogres: Headshot and if necessary Cross-Bow Stun with Alt Fire. Hell Bats: Headshot and Archers. Smeggit: Wind Belt, Floor Spikes, Tar, Arrow Wall, Blade Wall, Archer, Barricade. Strategy: On the North side place Barricades in the left entry to the rift, Set up a killbox in the right entry using Arrow walls, Tar and Floor Spikes. For the first 3 waves build up the killbox and use the wind belt to push Orcs into the acid or back into the killbox. At the end of round 3 spend most of your money on the North killbox but save a bit for a couple arrow walls on the south corridor. Guard the South entry for waves 4 and 5 while building up a killbox using Arrow Walls, Tar, Floor Spikes and Archers. From wave 6 they come from both sides so keep an eye on the mini-map, use the portals and the Wind Belt to keep Orcs in the killboxes. Enemy Tactics: Ogres: Stun with Cross-Bow and headshot them. Fryedegg: Lightning Ring, Tar, Brimstone, Arrow Wall, Floor Scorcher, Grinder, Swinging Mace, Barricade, Archers. Strategy: Barricade off the North-West entry to the rift, build a killbox in the North-East entry using Barricades, Tar, Swinging Mace, Grinder and Brimstone. At the end of wave 3 Barricade off the South-West passage and build another killbox in the South-East entry using Barricades, Tar, Swinging Mace, Grinder, Brimstone and Archers. From wave 6 start adding Archers to the North killbox and continue building up both killboxes with Archers, Floor Scorchers and Arrow Walls, stay in the central area so you can guard both killboxes and make use of the rift for mana regen. Use Lightning Ring and Cross-Bow to increase combos. Steel Weaver: Take the first upgrade at the end of wave 1 and take Burning Pitch during wave 7. Enemy Tactics: Ogres: Kite through killbox or Cross-Bow stun and headshot. Strategy: Take the Steel Weaver right from the start. For the first round place Arrow walls facing the lower spawn point and put Floor Spikes in front of the door, use Wind Belt on any that get through. At the end of the first round quickly sell the traps and use the portal then set up the same Arrow Wall and Floor Spike killbox in front of the top spawn point, use Cross-Bow on any that get through. At the end of round 2 quickly sell all the traps and build a stronger killbox on the top corridor using Barricades, Wall Blades and Tar. For wave 5 defend the lower corridor with the Wind Belt then start building a killbox in the lower Corridor using Barricades, Wall Blades, Tar and Arrow Walls. Use the portals to guard both corridors. Enemy Tactics: Ogres: Stun with Cross-Bow alt fire and headshot them. Gnoll Hunters: Wind Belt them into the lava. Fryedegg: Lightning Ring, Tar, Brimstone, Spring Trap, Floor Scorcher, Grinder, Swinging Mace, Barricade, Archers. Strategy: For the first wave build a killbox on the lower level just around the first corner using Grinder, Tar, Brimstone and Swinging Mace. At the end of wave 1 sell the Grinder and Mace then take the portal to the top level and build a killbox before the corner using Barricades, Tar, Grinder, Swinging Mace and Brimstone. After wave 3 go back to the lower level where the Barricade and Tar was left behind from wave 1 and rebuild the killbox again by adding Swinging Mace, Grinder. From this point continue to build up both killboxes to contain Barricades, Tar, Grinder, Swinging Mace, Brimstone, Floor Scorchers, Spring Traps and Archers. Use the portals to control both killboxes. Use Lightning Ring and Cross-Bow to increase combos. Steel Weaver: Take both Burning Pitch and Overcoiled Springs at the end of wave 6. Enemy Tactics: Ogres: Kite through killbox. Gnoll Hunters: Kite through killbox or Lightning Ring. Strategy: Barricade off the left corridor and middle room, build a killbox in the right corridor using Wall Blades, Tar, Floor Spikes, Arrow Walls and Archers. Use Wind Belt to push Orcs into Lava and to keep Orcs in the killbox. Enemy Tactics: Ogres: Stun with Cross-Bow alt fire and headshot them. Fryedegg: Lightning Ring, Blade Staff, Tar, Floor Spikes, Spring Trap, Swinging Mace, Grinder, Barricade, Archers. Strategy: For the first 3 waves build a killbox just after the bridge using Barricades, Grinder, Tar, Floor Spikes and Archers. At the end of wave 3 sell all traps and then Barricade off the East hall and central room. Build up a killbox in the West hall using Barricades, Tar, Grinder, Swinging Mace, Spring Traps, Floor Spikes and Archers. Use Lightning Ring, Blade Staff and Cross-Bow to increase combos. Enemy Tactics: Ogres: Kite through killbox. Smeggit: Wind Belt, Floor Spike, Tar, Arrow Wall, Pounder, Archer, Barricade. Strategy: Use Barricades to block off half the arena leaving open the South West corner where the roof is low. Build a killbox in the South West corner using Pounders, Tar, Floor Spikes, Arrow Walls and Archers. Use Wind Belt to keep Orcs in the killbox. Fryedegg: Lightning Ring, Blade Staff, Tar, Spring Trap, Floor Scorcher, Grinder, Swinging Mace, Barricade, Archers. Strategy: Barricade off half the Arena using the Advanced Barricade technique, start building up a killbox in the North-East corner using Barricades, Tar, Grinder, Swinging Mace, Spring Traps, Floor Scorchers and Archers. At the end of wave 6 rearrange the Barricades to funnel the orcs more efficiently. Use Lightning Ring, Blade Staff and Cross-Bow to increase combos. Steel Weaver: Take the first upgrade before wave 1 and take Burning Pitch at the end of wave 3. Smeggit: Wind Belt, Ice Amulet, Floor Spikes, Tar, Arrow Wall, Blade Wall, Archer, Barricade. Strategy: Build a killbox in the central choke point between the two bridges using Barricades, Blade Walls, Tar, Arrow Walls, Floor Spikes and Archers. Use Wind Belt to keep Orcs in the killbox. Enemy Tactics: Ogres: When they reach the killbox freeze them with Ice Amulet or Stun with Cross-Bow alt fire and headshot them. Gnoll Hunters: Freeze or Stun in the killbox or near the Paladin. Hell Bats: Ice Amulet and Archers. Hell Babies: Cross-Bow and Archers. Fryedegg: Lightning Ring, Blade Staff, Tar, Floor Spikes, Spring Trap, Zapper, Grinder, Barricade, Archers. Strategy: For the first wave put Zappers and Archers in the first choke point just after the bridge. After wave 1 sell the Archers and start building up a killbox in the first choke point using Barricades, Tar, Grinder, Floor Spikes, Spring Trap, Zappers and Archers. Use Lightning Ring, Blade Staff and Cross-Bow to increase combos. Steel Weaver: Take Overcoiled Springs at the end of wave 4, Burning Pitch during wave 6 and Jagged Steel at the end of wave 8. Enemy Tactics: Ogres: Kite through killbox. Gnoll Hunters: Blade Staff. Hell Bats: Archers, Zapper and Cross Bow. Hell Babies: Archers, Zapper and Cross Bow. Smeggit: Wind Belt, Ice Amulet, Floor Spikes, Tar, Arrow Wall, Blade Wall, Archer, Pounder. Strategy: In front of the 2nd spawn point cover the area with Floor Spikes and Arrow walls. Line the top area with Floor Spikes and Arrow Walls and put Archers at the end near the rift. Enemy Tactics: Ogres: Use the Ballista, put Tar in places where you have a clear shot at the Ogres. Fryedegg: Lightning Ring, Tar, Brimstone, Spring Trap, Zapper, Grinder, Swinging Mace, Auto Ballista, Archers. Strategy: For the first 3 waves build a killbox directly in front of the lower enemy spawn point using Brimstone, Tar and Archers. At the end of wave 3 sell all traps and start building a killbox on the top level using Swinging Mace, Tar, Grinder, Brimstone, Zappers, Auto Ballista Spring Traps and Archers. Use Lightning Ring and Cross-Bow to increase combos. Steel Weaver: Take the first upgrade before wave 1 and take Burning Pitch at the end of wave 3. Take Overcoiled Springs during wave 5 and Jagged Steel during wave 6. Smeggit: Wind Belt, Ice Amulet, Floor Spikes, Tar, Arrow Wall, Brimstone, Archer, Mace. Strategy: For the first 3 waves set up a killbox at the North choke point using Swinging Mace, Tar, Floor Spikes and Brimstone. At the end of wave 3 sell all traps and set up a killbox in the East choke point using Swinging Mace, Tar, Arrow Walls, Floor Spikes, Brimstone and Archers. Defend the West choke point while building up another killbox using Swinging Mace, Tar, Arrow Walls, Floor Spikes, Brimstone and Archers. Enemy Tactics: Fire Ogres: Ice Amulet. Fryedegg: Lightning Ring, Blade Staff, Tar, Spring Trap, Floor Spikes, Grinder, Swinging Mace, Barricades, Archers. Strategy: For the first couple waves build a killbox in the North entry using Swinging Mace and Tar. At the end of wave 2 or 3 sell all traps and use Barricades to block the East rift. Start building a killtrap in the West entry using Barricades, Swinging Mace, Tar, Grinders, Floor Spikes, Spring Traps and Archers. Use Lightning Ring, Blade Staff and Cross-Bow to increase combos. Steel Weaver: Take the first upgrade before wave 1 and take Burning Pitch during wave 5. Take Overcoiled Springs and Jagged Steel at the end of wave 6. Smeggit: Wind Belt, Ice Amulet, Tar, Arrow Wall, Blade Wall, Archer, Brimstone, Barricade. Strategy: Barricade the left hall and build a killbox at the entry to the right hall using Wall Blades, Tar, Brimstone and Archers. Use the Wind Belt to keep orcs in the killbox. Put lots of Archers and the back end of both hallways to take out air units. Enemy Tactics: Ogres/Fire Ogres: Ice Amulet and head shots. Hell Bats: Ice Amulet and Cross-Bow. Hell Babies: Archers and Cross-Bow. Sappers: Place Archers behind the Barricades, if you stagger the Archers they should not all target the same Sapper. Fryedegg: Lightning Ring, Blade Staff, Tar, Spring Trap, Floor Spikes, Grinder, Floor Scorcher, Barricades, Archers. Strategy: Barricade off the West passage and build up a killbox in the entry to the East passage using Barricades, Tar, Grinders, Floor Spikes, Spring Traps, Floor Scorchers and Archers. Place some Archers around the rift to defend against flyers and add some Grinders + Tar to the Wast passage to protect the Barricades from Sappers. Use Lightning Ring, Blade Staff and Cross-Bow to increase combos. Steel Weaver: Take the first upgrade before wave 1 and take Burning Pitch at the3 end of wave 3. Take Overcoiled Springs and Jagged Steel during wave 5. Enemy Tactics: Ogres/Fire Ogres: Kite through killbox. Hell Bats: Cross-Bow, Lightning Ring and Archers. Hell Babies: Cross-Bow, Lightning Ring and Archers. Sappers: Try and stand in front of the killbox where Sappers will target you and not Barricades, use Grinders as backup protection. Smeggit: Wind Belt, Ice Amulet, Tar, Arrow Wall, Archer, Mace, Brimstone, Barricade. Tip: You can block the side halls with just 1 Barricade each. Strategy: Barricade the Left and Right hallways and build a killbox in the central hallway using Swinging Maces, Tar, Brimstone, Arrow Walls and Archers. Use the Wind Belt to keep orcs in the killbox. Enemy Tactics: Fire Ogres/Armored Ogres: Ice Amulet while they are in the killbox. Gnoll Hunters: Ice Amulet and Archers, it helps to have a Swinging Mace over the Archers to kill frozen Hunters. Sappers: They don’t seem to go for the Barricades so just shoot them in the killbox. Strategy: For wave 1 build a killbox in the West Hall at the first choke point using Barricades, Swinging Mace and Tar. At the end of wave 1 Barricade off the Central and East halls. Continue building up the killtrap to contain Barricades, Swinging Mace, Tar, Grinder, Floor Spikes, Spring Traps and Archers. Use Lightning Ring, Blade Staff and Cross-Bow to increase combos. Steel Weaver: Take the first upgrade before wave 1 and take Burning Pitch during wave 3. Take Overcoiled Springs and Jagged Steel at the end of wave 6. Enemy Tactics: Armored Ogres/Fire Ogres: Kite through killbox. Gnoll Hunters: Blade Staff and put Swinging Mace + Tar in front of the Archers. Sappers: Just shoot quick and replace any Barricades destroyed. Smeggit: Wind Belt, Ice Amulet, Blade Staff, Tar, Arrow Wall, Archer, Mace, Brimstone, Paladin. Strategy: For the first 3 waves build a killbox in the North choke point using Swinging Mace, Tar, Arrow Walls and Brimstone. After the 3rd wave sell all the traps and build a killbox on the Left chokepoint using Swinging Mace, Tar and Brimstone. Layer the Brimstome up the steps to clean up any that get through. From wave 5 start to build up a similar killbox on the Right chokepoint using Swinging Mace, Tar and Brimstone, again layer the Brimstome up the steps to clean up any that get through. From wave 7 start building a killbox in the North choke point using Swinging Mace, Tar and Brimstone. For the last waves add some Paladines and Archers. 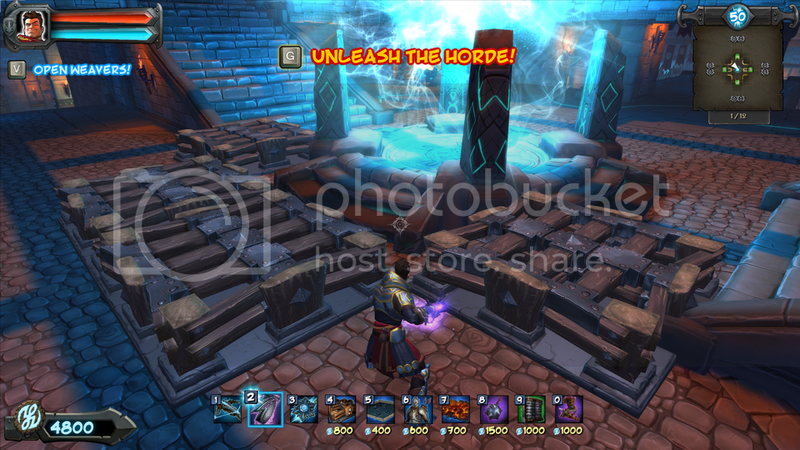 Enemy Tactics: Ogres: Ice Amulet and Blade Staff. Gnoll Hunters: Wind Belt into traps or Ice Amulet and Blade Staff. Fryedegg: Lightning Ring, Tar, Brimstone, Wall Spikes, Spring Trap, Floor Scorcher, Grinder, Swinging Mace, Barricades. Smeggit: Lightning Ring, Ice Amulet, Tar, Arrow Wall, Blade Wall, Archer, Brimstone, Barricade, Mace. Strategy: Build a killbox in the entry just after the bridge using Swinging Mace, Tar, Brimstone Arrow Walls and Archers. Take out air units by hand with Ice and Lightning. Enemy Tactics: Frost Ogres: Cross-Bow Stun them in the killbox and headshot them. Hell Bats: Ice Amulet and Cross-Bow. Hell Babies: Lightning Ring and Cross-Bow. Fryedegg: Lightning Ring, Tar, Brimstone, Wall Spikes, Spring Trap, Grinder, Swinging Mace, Barricades, Archers. Smeggit: Lightning Ring, Ice Amulet, Blade Staff, Tar, Archer, Brimstone, Barricade, Spring Trap, Decoy. Note: Credit to Rogotin who came up with the Barricade placement. Strategy: Block the right side using 2 Barricades (thanks again Rogotin). Set up a killbox on the left side in the open area beside the pit using Brimstone, Tar and Archers. Use the Lightning Ring alt fire to assist the killbox. Enemy Tactics: Ogres: Use the Ballista. Gnoll Hunters: Use the Ballista or Ice Amulet and Blade Staff. Hell Bats: Ballista or Ice Amulet. Fryedegg: Lightning Ring, Tar, Brimstone, Floor Scorcher, Spring Trap, Grinder, Swinging Mace, Barricades, Zapper. Smeggit: Ice Amulet, Flame Bracers, Tar, Arrow Wall, Archer, Brimstone, Barricade, Grinder, Mace. Strategy: For the first 3 waves defend the North corridor by hand while building a killbox in the South corridor using Barricades, Swinging Mace, Tar, Brimstone, Grinders and Archers. From wave 4 start building a killbox in the North corridor using Swinging Mace, Tar, Brimstone, Arrow Walls and Archers. Enemy Tactics: Armored Ogres/Fire Ogres: Freeze with Ice Amulet while in the killbox. Hell Bats: Ice Amulet. Smeggit: Wind Belt, Lightning Ring, Ice Amulet, Tar, Arrow Wall, Brimstone, Barricade, Grinder, Mace. Strategy: For the first 3 waves defend the right side by hand while building a killbox on the left side using Swinging Mace, Tar, Brimstone and Arrow Walls. From wave 4 start building a killbox on the right side using Swinging Mace, Tar, Brimstone and Arrow Walls. Enemy Tactics: Frost Ogres/Fire Ogres: Shoot with Ballista while in the killbox. Gnoll Hunters: Wind Belt into Acid or Ice Amulet while in the killbox. Sappers: Not using Barricades so Sappers are not an issue. Hungry Hungry Hippos: Lightning Ring, Blade Staff, Tar, Archer, Barricade, Brimstone, Mace, Grinder, Floor Scorcher. Note – At the time of posting this is the 1# high score for WarMage. Brimstone, Tar, Grinders, Swinging Mace, Floor Scorchers and Archers. Enemy Tactics: Ogres: Kite them back and forth through the killbox. Gnoll Hunters: Kite through traps. Sappers: Try and kill them quick and rebuild any Barricades they destroy. Rogotin: Ice Amulet, Tar, Mace, Barricade. Note – Yes, just 3 traps and 2 weapons (including the X-bow), and he makes it look easy 0_o. area near rift using Swinging Mace, Tar and Ice Amulet. Between waves sell and move hallway Barricades, some killboxes are sold and replaced with Barricades while others are saved for later. Later Rounds: Barricade 2 corners and set up killboxes in the other 2 corners using lots of Swinging Maces and Tar. Use Barricades to give Ogres a long path to reach the rift. Enemy Tactics: Ogres: Jump in a Ballista to weaken them then stun them in the killbox using Ice or the Cross-Bow Alt fire. Kite them where necessary and use Barricades to give them a long path. Gnoll Hunters: Ice Amulet. Sappers: Just replace any Barricades destroyed. Smeggit: Lightning Ring, Ice Amulet, Tar, Brimstone, Barricade, Grinder, Mace, Archers, Auto Ballista. Strategy: Start by blocking the North side of the rift with 4 Barricades placed directly in front of the rift and put some Archers on the South-West side of the rift on the upper level. Take out wave 1 with Lightning ring and Ice Amulet, make use of the rifts mana regen as the orcs walk past the Barricades. At the end of wave 1 Barricade up the 2 South entry points to the rift and place a Swinging Mace with Tar in the South-East entry point (as long as you guard this South-East point the Sappers should go for you and not the barricades). At the end of wave 2 Barricade off the South-West entry point leaving the South-East entry as the only path to the rift. From this point onwards continue to build up the killbox in the South-East entry using Swinging mace, Tar, Grinders, Brimstone, Archers and Auto ballista. Steel Weaver: At the end of wave 5 go straight for Burning Pitch. Upgrade traps with Overcoiled Springs around wave 7. Enemy Tactics: Fire Ogres/Armored Ogres: Kite through killbox and freeze with Ice Amulet. Frost Ogres: Kite through killbox and Cross-Bow Stun. Gnoll Hunters: Ice Amulet while in the killbox or in front of Archers. Sappers: Just replace any Barricades destroyed. ArcheKruz: Lightning Ring, Ice Amulet, Blade Staff, Fire Bracers, Paladin, Swinging Mace, Tar, Grinder, Coin Forge. My strategy for the finale was to grab the Steel Weaver and the Guardian Armor upgrade, and create a paladin mosh pit at the front right after the first set of stairs the orcs have to climb with 4 paladins and 2 coin forges. I used a thundercloud to help with one side while I spam the other side with crossbow. This is effective for the first 4 waves, as this manages to reimburse the money spent on the Paladins and the Forges. At the end of Wave 4, I sell everything, and used the money earned to buy 8 Mace Traps, and put a Paladin behind each trap. I used the remaining money to buy Tar Pits at around the south end for wave 5, then north end for wave 6. On wave 6 I just have to sit back and replace any Paladins that die to the sapper explosions. By Wave 7 and 8 , I was able to buy a second set of 8 Paladins. After Wave 8, I sell all the Paladins and rebuy them at the proper positions, then I start to buy Grinders and put them at the sides of the mace traps. During that time, I would just keep on running around and downing any stragglers with Lightning or Fire+Ice combo and replacing any lost Paladins. The advantages of using Paladins in Warmage mode is that they get back up during break time, if they die earlier, which means less money wasted on replacing barricades, which do not return after being busted. By the end of it, I had 8 Maces, 16 Paladins, 24 tar traps and 16 grinders. No Barricades were used. Fryedegg: Blade Staff, Lightning Ring, Tar, Brimstone, Floor Scorcher, Wall Spikes, Archers, Paladin, Boom Barrel. Smeggit: Wind Belt, Lightning Ring, Ice Amulet, Tar, Arrow Wall, Brimstone, Archer, Mace, Decoy. Strategy: For the first 3 waves defend the Left side by hand making heavy use of the re-useable Acid Pots the map provides. While defending the left build a killbox on the Right side in the low roof area near the rift using Swinging Mace, Tar, Brimstone, Arrow Walls Decoy and Archers. From wave 4 start building a killbox on the Left side in the low roof area near the rift using Swinging Mace, Tar, Brimstone, Arrow Walls Decoy and Archers. Enemy Tactics: Gnoll Hunters: Distract with Decoy and Wind Belt into Acid. Cyclops Mage: Can’t get through the killbox so ignore them. Sappers: Not using Barricades so Sappers are not an issue. Fryedegg: Lightning Ring, Tar, Brimstone, Floor Scorcher, Wall Spikes, Floor Spikes, Pusher, Swinging Mace, Archers. Smeggit: Lightning Ring, Ice Amulet, Flame Bracers, Tar, Arrow Wall, Brimstone, Archer, Grinder, Auto Ballista. Strategy: Start by filling the central platform with Archers to take care of Frost Bats, defend the top level by hand. From wave 3 start building a killbox on the middle level using Brimstone, Grinds, Tar, Arrow Walls and Auto Ballista. Enemy Tactics: Fire Ogres: Ice Amulet and Auto Ballista while in the killbox. Gnoll Hunters: Ice Amulet while in the killbox. Frost Bats: Archers, Flame Bracers and Cross-Bow. Sappers: Not using Barricades so Sappers are not an issue. Fryedegg: Lightning Ring, Tar, Brimstone, Floor Scorcher, Wall Spikes, Floor Spikes, Spring Trap, Grinder, Archers. Smeggit: Lightning Ring, Ice Amulet, Blade Staff, Tar, Arrow Wall, Brimstone, Archer, Mace, Barricade. Strategy: Barricade the Right side and build a killbox on the Left side near the rift using Swing Mace, Tar, Brimstone, Arrow Walls and Archers. Use Wind Belt to keep Orcs in the killbox. Enemy Tactics: Fire Ogres/Armored Ogres: Freeze with Ice Amulet while in the killbox. Gnoll Hunters: Ice Amulet and Blade Staff. Sappers: Don’t seem to go for the Barricades so not a problem. Fryedegg: Lightning Ring, Tar, Floor Scorcher, Wall Spikes, Spring Trap, Grinder, Barricades, Swinging Mace, Archers. Smeggit: Lightning Ring, Ice Amulet, Tar, Arrow Wall, Grinder, Archer, Brimstone, Mace, Barricade. Note There’s a small bug in regards to Barricade placement. Strategy: Barricade the Left and Central corridors, set up a killbox in the right corridor using Swinging Mace, Tar, Arrow Walls and Brimstone. On wave 3 set up a second killbox to catch the Kobolds using Barricades and a Grinder. Enemy Tactics: Fire Ogres: Ice Amulet while in the killbox. Gnoll Hunters: Ice Amulet while in the killbox. Cyclops Mage: Ice Amulet while in the killbox. Sappers: If you stay near the top of the stairs they should come for you rather than the Barricades, use Brimstone and Arrow Walls as backup protection. Fryedegg: Lightning Ring, Tar, Brimstone, Floor Scorcher, Wall Spikes, Floor Spikes, Spring Trap, Barricades, Zapper. Smeggit: Lightning Ring, Ice Amulet, Flame Bracers, Tar, Grinder, Archer, Brimstone, Mace, Barricade. Strategy: Place Barricares so that the left path is completely blocked and the right path forces Orcs over the bridge, for the first 3 waves use wind belt to push Orcs into the Lava. Use Ballista on air units. At the end of round 3 set up a killbox on the right side near the rift using Swinging Mace, Tar, Barricades, Brimstone, Grinders and Archers. Enemy Tactics: Frost Ogers: Flame Bracers and Cross-Bow stun while in the killbox. Gnoll Hunters: Wind Belt into Lava or into traps. Frost Bats: Flame Bracers or Ballista. Hell Bats: Ice Amulet or Ballista. Fryedegg: Lightning Ring, Tar, Floor Scorcher, Wall Spikes, Spring Trap, Grinder, Swinging Mace, Barricades, Archers.